This Instant Pot sweet potato casserole is the perfect Thanksgiving side dish or make it year round and serve it with dinner as a real treat! 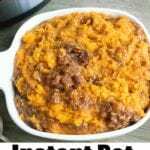 Are you looking for some Instant Pot Thanksgiving recipes or a yummy new side dish to try well this Instant Pot sweet potato casserole is to die for, we’ll show you how to make pressure cooker sweet potatoes too. We are always coming up with new Instant Pot recipes for dinner but now that the holidays are getting closer we’re adding our favorite traditional dishes too so take a look. 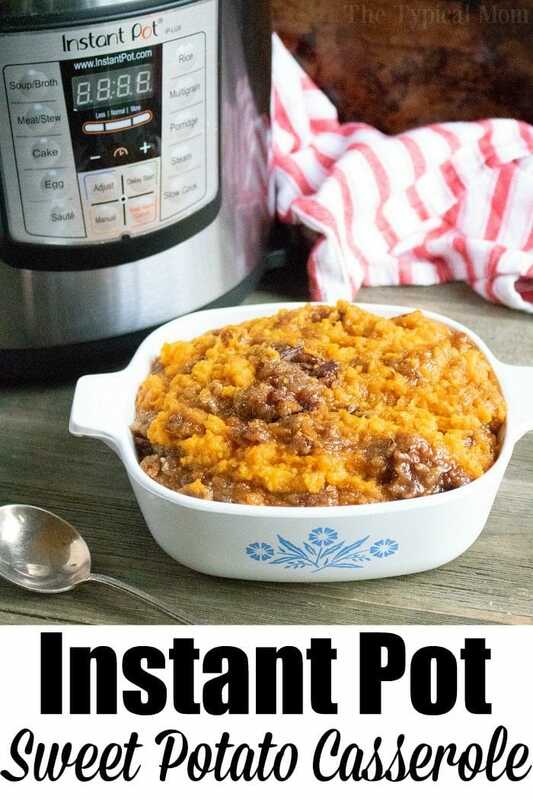 Wondering how to make Instant Pot sweet potato casserole?? Well it isn’t hard at all with just a little water and my favorite my favorite Instant Pot vegetable steamer basket! 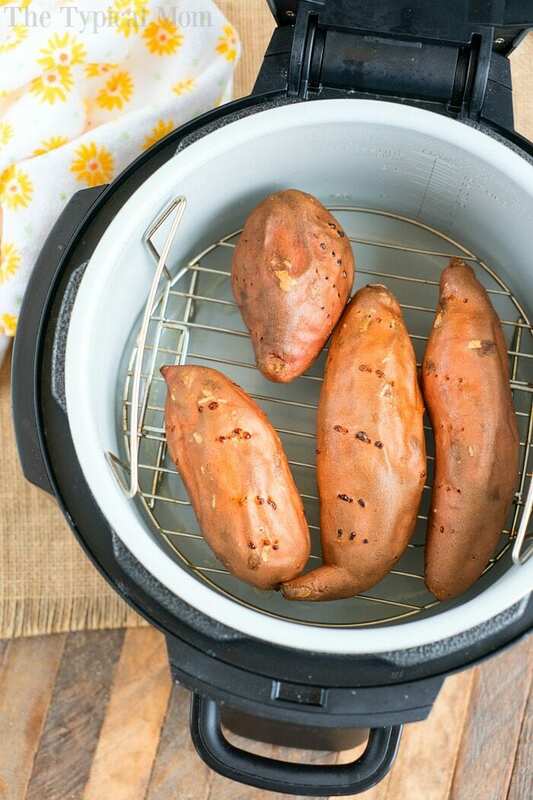 We make pressure cooker baked potatoes quite often too but sweet potatoes are a fun color with a different taste that the kids love, even if they aren’t in sweet potato casserole. Add a bit of butter on top with a sprinkle of cinnamon and sugar and it’s a sweet treat that can either be dessert or a side dish with protein. Here’s what sweet potatoes look like after they’re cooked in your pressure cooker…. You can make sweet potato in the air fryer as well! 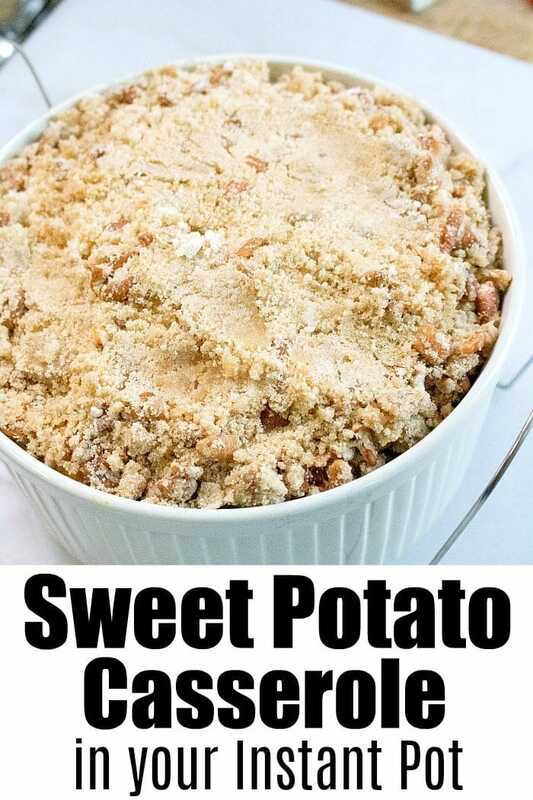 This is what it will look like if you continue to follow the steps below in the recipe card to make Instant Pot sweet potato casserole! You can leave the nuts off if you don’t like them or have a nut allergy and it will be just as good. 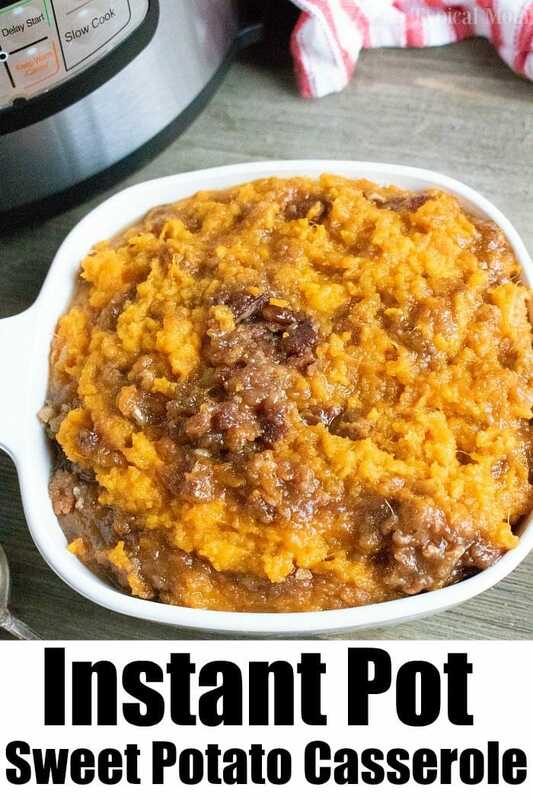 I don’t know about you but this dish is something I look forward to every year, but now this Instant Pot sweet potato casserole recipe makes it even easier to do. What’s the benefit of cooking in your Instant Pot during the holidays? It frees up the oven for your turkey, though you can make a pressure cooker turkey in it too! If you don’t have a pressure cooker these melting sweet potatoes are a great side dish option for the holidays! The printable recipe is below! Place sweet potatoes in a steamer basket over 1 cup water in the inner pot. Close lid and set valve to sealing. Set for high pressure for 22 minutes. 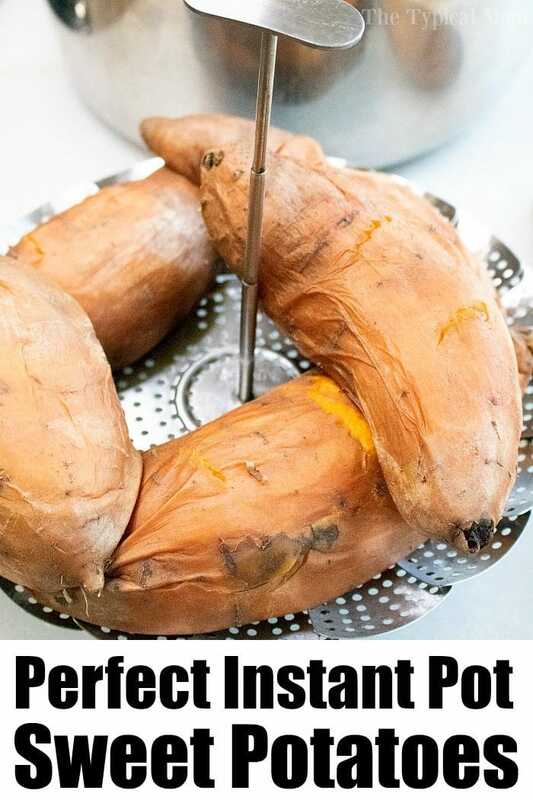 Do a quick release and remove the sweet potatoes from the instant pot. Remove peelings and mash in a large bowl with a fork. Add in the sugar, butter, eggs and 1/4 c. of heavy cream and mix together until smooth. If it is too thick for you, add a bit more heavy cream. In a separate bowl, mix together the topping ingredients. Place 1/2 of potato mixture in a casserole dish that fits into your Instant Pot, cover with 1/2 the topping mixture, then cover dish with foil. Add 1 cup of water to the inner pot of the Instant Pot and then lower the casserole dish into the inner pot on to a trivet. Cook on high pressure for 20 minutes. Do a quick release when the cooking time has finished, remove from pot and serve in another dish or on a trivet (this one will be hot). Does this make 2 casseroles since it’s only using 1/2 of the sweet potatoes & 1/2 of the topping? I am wondering the same. Not sure if she left out to layer the other half of the SP and topping ONTO the original or if it is left to complete as a second batch to cook in the IP. Maybe she will weight in soon.